"This is a creamy, fruity, heavenly dessert. I've been told it's like super-charged strawberry shortcake!" In a bowl, sprinkle the strawberries with sugar; stir to distribute the sugar, and set aside. Chill a large metal mixing bowl and beaters from an electric mixer. Pour the cream into the chilled mixing bowl, and add white chocolate pudding mix, lemon yogurt, and about 1 tablespoon of coconut rum, if desired; beat until fluffy with an electric mixer set on Medium speed. Spread a layer of pound cake cubes into the bottom of a glass 10x15-inch baking dish, and sprinkle the cubes with another tablespoon of coconut rum. Cover the pound cake with a layer of strawberries; sprinkle blueberries over the strawberries. Spread a thick layer of whipped cream over the berries. 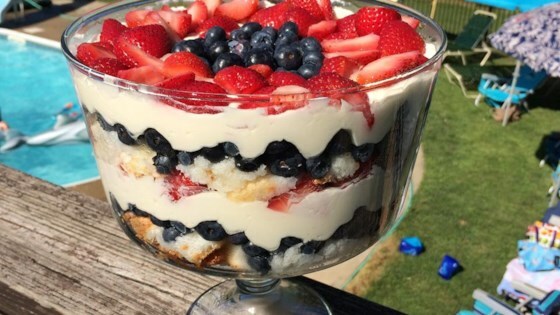 Repeat the layers several times, ending with a layer of strawberries sprinkled with blueberries and reserving about 1 cup of whipped cream; top the trifle with dollops of whipped cream to serve. Refrigerate leftovers. Kids loved it at our 4th of July event! Adults too! Definitely will make again. Use toothpicks on top so that you can cover the dessert without the mess getting on saran wrap.